The tri-state area (KY TN VA) really has a lot to see, and us having been here most of our lives about all we want to see are friends and family. We park the rig at the CGNP about 6 miles from US 25 E on hwy 58 in VA. It is a nice GC with 50 amp electric, a dump station, a place to take on water, and PLENTY OF TREES. I was shocked when I hit the button for the satellite and it found our direct TV satellite. It could only tune in at 40-50 %, but that is enough for us to watch TV. The track vision we have on the Kountry Star has found the satellite a few times when I would have bet there would be no way it could, so I am VERY PLEASED with it. 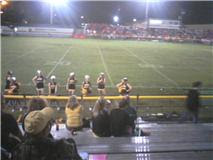 We got to visit family, Marcia got her bingo fix, I watched Miss Jordyn cheer at the high school football game. Saturday we drove to Corbin to, ran all over the town looking for where the soccer game was going to be played. Miss Jordyn cheers for the high school, and plays soccer. Once we found the "NEW" school we spent a couple hours waiting with the team before they called the game due to the thunder storms rolling through the area. That gave us plenty of time to visit with Ruby and Miss Jordyn. Jordyn is the second girl from the left in the bottom row. Sunday we will pull up the jacks, and roll the wheels about 60 miles to the Escapee's Raccoon Valley RV Park. We will be taking dad with us so we can take him to his doctor in Knoxville Monday. Tuesday, or maybe Wednesday we will head to FL so we can get everything ready for our cruise to Cancun. I welcome comments, just please keep it clean and no SPAM. Oh No Snow In Apache Junction! We are trying to chase the seventies,the sixties are too cold and the nineties are too hot. Last night in the USA. Enjoy them while you can. What attracts People to R V Rallies?